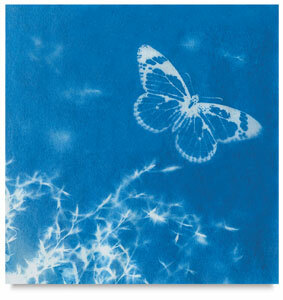 Make fascinating white-on-blue prints from natural or man-made materials. Just place flat objects (leaves, flowers, insects, lace, jewelry, etc.) on the sun-sensitive paper, expose the materials to the sun, and create photo-montage images. No inks, presses, photo equipment, darkroom, or chemical processes are needed. Prints develop in tap water in seconds. Fun for any age group. Instructions are included. Non-toxic. 5" × 7" sheets. 30-sheet package. Nature Print Kit — Includes 80 Nature Print sheets measuring 4" × 4", 6 transparent sheets containing a total of 33 images, one frame holder, and instructions. ® Nature Print is a registered trademark.